I felt very guilty trialling the New Eatsmart Choc Chip meal replacement because it just tasted too sinful to be good for me. The powder shook up well and there no lumps. As for the shake itself, it shook up quite thick and it was like drinking chocolate mousse made with dark chocolate. To top it off there were little choc chips at the bottom of my shaker to satisfy my chocolate sweet tooth. I did check the label that this was a meal replacement I was taking and not a choc drink from Nestle! 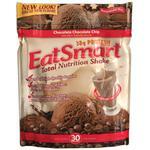 Eatsmart is product by Isatori from Canada and their supplments are usually high quality and pure, and this is no exception. Eatsmart contains all the whizz bang ingredients you want in a replacement and includes Whey Isolates, concentrates and calcium caseinates for that long lasting breakdown of protein. There's also flax seed for fatty acids, chromium to maintain blood sugar and pro biotics. In total, Eatsmart contains 150 calories, 19 grams of protein, 7 grams of low-glycemic carbohydrates, less than five grams of "good" fats, and healthy fiber. Overall I thought it was a good formula and it satisfied my afternoon protein requirements and that little bit of sweetness was great to have too. My fave ofcourse was the choc chip but the vanilla ice cream wasn't too bad either, not too sweet. There's also a Chocolate peanut butter flavour which tasted more like a light choc flavour and not overwhelmingly peanuty. I think these are available at Health 2000 stores. The VPX NO Shotgun v.3 and Synthasize are pre and post workout drinks aimed to increase energy, focus and recovery for your workouts. Synthasize is stimulant free while Shotgun v.3 has extra caffeine and 'redline energy meltdown fat burning technology' for those who like more kick in their workouts. Both have the basic formula containing protein, BCAAs, taurine, creatine (and more) which aim to help energy and recovery. I was given some BSN protein samples so I thought I'd give them a go! BSN. Syntha 6. I had the vanilla, was quite nice although I did find it bit sweet. Probably dieters would appreciate having something sweet to drink. Coupled with the protein isolate, it does contain protein concentrate and casein which gives the syntha the sustained released protein the package promises. Added MCTs, EFAs and fibre also gives it the low GI effect and adds to the sustained release. Contains 23g protein, 13g carbs and 6g fat per serve. The NEW range from Balance is called Physique which is a weight management fomula targeted to help today's active sporting figures get more protein and energy for their fitness endeavours. Physique's special weight management ingredients include: L-Carnitine, Hydroxy Citric Acid and Green tea which combine to provide fat burning and thermogenic properties. Nutrition value: per serve Physique contains: 21g protein, 2.0g fat, 2.6g carbohydate. 118 cals. Well my tastebuds and belly have been spoilt trialling the NEW Physique flavours from Balance, and I must say they've done a pretty job with the formula. I'm not usually into formulas, especially ones with little bit of thermos in them, as they tend to make me bit anxious and revved up. But I've surprisingly handled this one quite fine. I even had them at around 3pm and the effects didn't even keep me up at night! So I think Balance got it right not putting too much of the green tea in it. All the flavours mixed well and it shook up quite nice and thick. About an hour after drinking it I felt abit tingly and my heart racing, not like as if I was taking thermos, but could definitely feel something going on. Balance are being super kind again to us by giving us something else to giveaway this week! Winner of the Tub is Attila Balough. Dianne Walker, Mose Petaia, Jemma Callaghan, Karen Stokes, Pete Siolo, Vanessa Moase, Hineruru Teia, Kim Yates, Cara Dee, C. Martin, Kim Kruger, Kat Hall, Sarah Calman, Bonita Wright, Lucie Thompson, Kaha Cassidy, Lisa Cameron, Luke Keegan, Janelle Taft, Stu Fordyce. Your bar will be on the way to you to enjoy shortly! You may have read elsewhere on the site about these PureFit bars that I spotted at the recent Auckland Gluten and Allergy show, so I thought I would do a further review of the flavours and content. But how do they taste????!!!! The base ingredients of these bars is soy protein, soy crisps, soy nuts, ground almonds and a blend of other glucose and natural juices and flavours. If you're allergic or intolerant to soy then this bar's not for you! Each bar contains roughly 26g carbohydrate (16g sugar), 18g protein and 6g of fat. Its marketed like the zone bar following the 40/30/30 rule. Purefit doesn't market itself as a protein bar but 18g is still quite good for a nutrition bar, although we thought 16g of sugar is quite high. Sugar, whether its in from natural juices or other forms of glucose, is still sugar so make sure it fits within your daily calories. This bar would probably be great after your workout or sport when you need a good food source which contains high sugar levels to replenish glycogen stores. So onto the taste. First up was the Berry Almond Crunch. Considering that soy and ground almonds form most of the bar, I was expecting it to be a bit cardboardy, but it was actually quite firm and chewy but wasn't hard to chew. The bar tasted a little nutty but the berry flavour really comes through. The bar was quite filling although it did taste a little flourey towards the end. Chocolate Brownie was next down the hatch. Being a chocolate lover, I was looking forward to tasting this. And this bar actually did taste like chocolate brownie, the chocolate was more like dark chocolate taste than sweet. Once again good texture and filling. Not a big fan of peanut butter or nuts in general but I quite liked the Peanut Butter Crunch. It didn't taste overly nutty and had a tinge of sweetness. Almond Crunch was probably my least favourite as it had a weird chemically after taste. I later found out that its a marzipan flavour. Maybe it was too much almond for me as my stomach felt slightly sensitive to this afterwards. Overall I think the flavours and the bars are fine. Just be careful to eat them at the right times as the sugar cals can add up.